1. 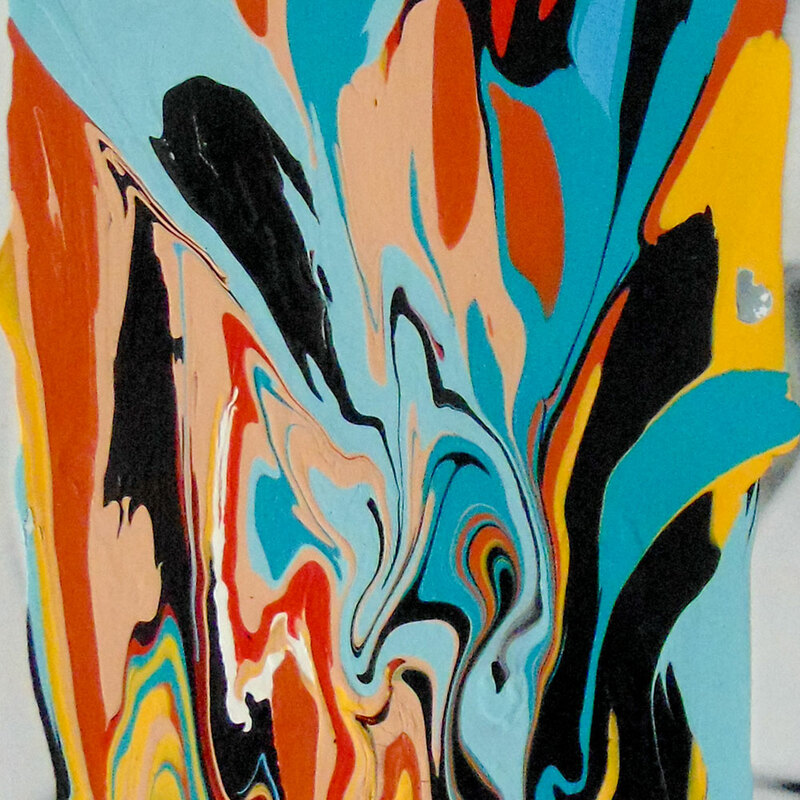 You send an artwork image. 2. Our designers draw 3 options. 4. Wait and see! 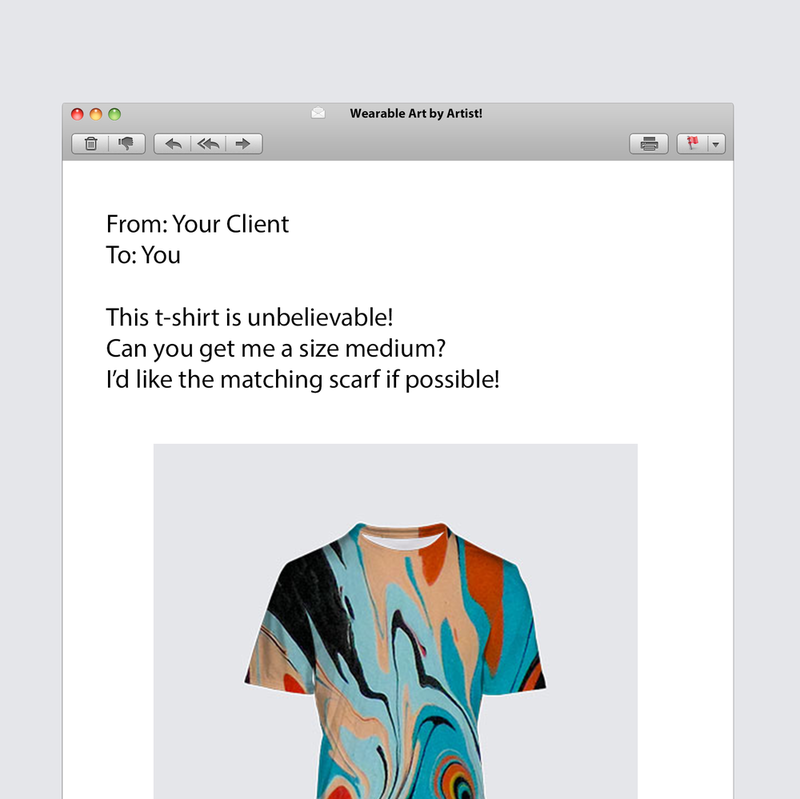 You might receive orders for your designs. If so, you’re in business before you’ve spent a single dollar. If the designs generate very little to no excitement, then a journey into the world of wearable art might not be for you and that’s also fine! The Social Tester allows artists to validate if they have a market to sell premium fashion products derived from their art. Some artists manage their own gallery, some have been successfully selling art-derived products for years while others have tremendous following on social media or a successful e-commerce platform. For them, it just made so much sense to jump right into our Designer Program but this wasn’t the case for the vast majority of our clients. Before finding us, most of our best clients were devoted artists who’d never sold anything other than an original work of art, let alone a reversible dress! Something in their gut told them there was a gem to discover and invest in here. They couldn’t picture themselves selling phone cases or coffee mugs but a premium & exclusive Montreal-made tunic designed for real women with great taste; perhaps they could do that. The Social Tester was built for artists who’ve that hunch but also feel like testing the waters by asking their friends, family and fans what they think before embarking on such an exciting new adventure. We are super nice to work with! Q: What happens if my friends and fans actually want to order the products when I ask for their feedback? Is it possible or is this really just a test? A: We don’t want unhappy customers anymore than you do. We’ll place the order, produce the goods and send them your way! Q: Where are the products manufactured? A: Everything we do is made right here in Montreal. Q: Does my client pay Le Galeriste or does she pay me? A: She pays you. If the product retails for $100, your client will pay you $100. OUR client is YOU. And you pay $45 for that same product. Which means you’ve made a gross profit of $55 on that sale. If you don’t want to handle the payments, no problem. However, you should know that you make 10 to 12 times less revenue on a dress WE sell than on a dress YOU sell. You can upload your art in our Representation Program for a chance to be selected. Q: Will my products be on your website? A: We can put them online if you want but we don’t recommend it. 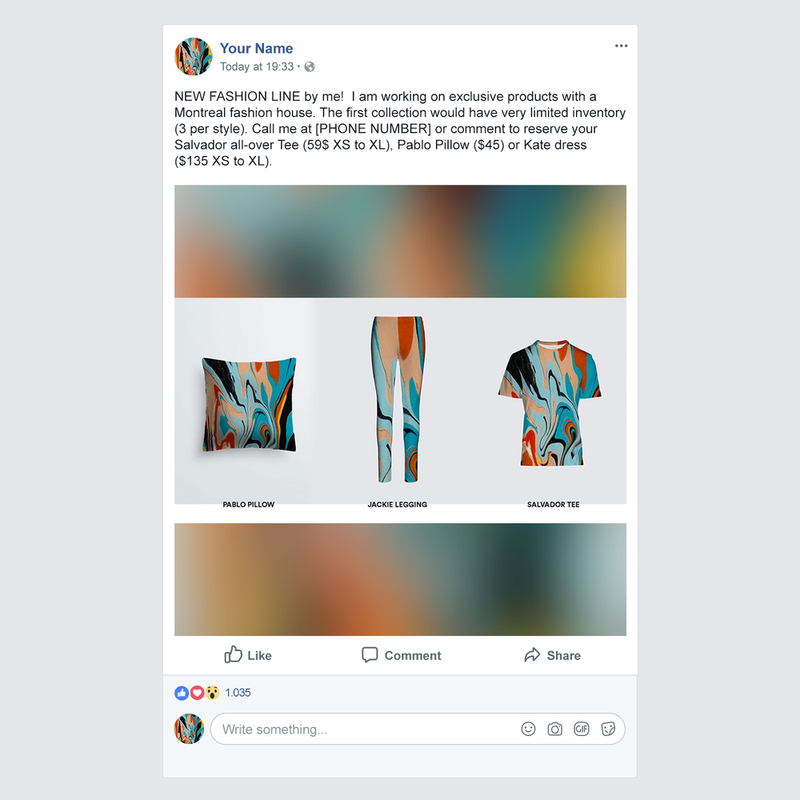 Artists with the intention of actively promoting their fashion products should do so on their own (on Facebook, in galleries, via email, at art events, etc.). Whatever we sell on the website or in stores will generate royalties 10 to 12 times smaller than what you would’ve made selling it on your own. Q: Do you ship to my client or do I? A: That’s up to you. Most artists choose to handle the shipping (in most cases, they ask the client to pick-up the product which creates a nice opportunity to show them the new original art they’ve been working on). Shipping fees are much cheaper if you bundle your orders. Plus, there’s a $10 surcharge whenever you order less than 3 units of a given style. It’s another good reason to bundle your orders! Q: Should I be worried about intellectual property/my rights? A: You keep 100% of the intellectual property (IP). Our mission is to help artists generate revenues from their IP. Museums and artists all over the world have trusted us with tens of thousands of artworks in large part due to our 100% local vertical supply chain. “No third party involved” means your art can’t end up on a Chinese computer designing cheap mugs to be sold without your consent (by the way, if you do work with companies that produce art-derived goods overseas, you should triple-check that they actually own the factory. Otherwise, it would be close to impossible for them to guarantee your art is protected from illegal copy). Please note that we don’t handle CARFAC licenses. Q: Will you sell my products to other people? A: No. They are made exclusively for you. Q: Some friends think that my value as an artist will decrease if I start offering fashion products derived from my art... What do you think? A: We’ve produced La Joconde for Le Louvre de Paris. We’ve produced for the Robert Mapplethorpe Foundation. We were granted the rights to a famous picture of John Lennon and Yoko Ono. So no, we don’t think premium fashion products with your art will reduce your value as an artist. Quite the opposite actually! Very few people get to see the beautiful artworks hanging on bedroom walls. It’s hard to talk about something you can’t see. What if your art could walk the streets worn by your best & most loyal admirers? We believe that’s a great way to build your name as a recognized artist. And it’s marketing that pays you, not the other way around! Q: Do you take a cut on my sales? A: No. We sell you the products at the best price we can, we suggest a retail price, and then you sell it at the price you want. Our suggested gross profit margin for the artist is 55%. We don’t recommend selling at less than a 40% margin nor at more than a 65% margin. Q: Can I add my signature to the products? A: Yes, all we need is a picture of your signature on white paper. Q: Can you help me choose the artworks I should submit for fashion designs? A: Unfortunately, we can’t help with that. We insist that this come from the artist. Choose the ones that speak most deeply to you, the artworks closest to your heart. Also, choose artworks for which you have a quality picture. Q: How do I know if my artwork picture is good enough to be well transferred onto fabric? A: You can just send us the heaviest file you have and we’ll let you know if there’s a problem. If you want to get technical about it, we require a resolution of at least 100 DPI in real size. If you wanted technical details, then you probably have Photoshop installed on your computer. Open your image in Photoshop. Under “Image”, select “Image Size”. Change the resolution to 100 pixels per inch. Make sure “Resample Image” is UNCHECKED. If either the Width or Height exceeds 38 inches, you’re all good! If it’s between 20 and 38 inches, our designers will be limited in their design options as they won’t be able to zoom in on details they like. But not to worry, we should still be OK. If it’s less than 20 inches, then no, the image isn’t good enough. Sorry. Q: What’s the next step? A: Just fill the form hereunder! If you still have unanswered questions, please contact us. *We recommend you upload 4 or 5 arworks to start. Pick the ones closest to your heart. They usually make better products. Do you wonder if your image is big enough to to transferred to fabric? You can just send us the heaviest file you have and we’ll let you know if there’s a problem. If you want to get technical about it, we require a resolution of at least 100 DPI in real size. If you wanted technical details, then you probably have Photoshop installed on your computer. Open your image in Photoshop. Under “Image”, select “Image Size”. Change the resolution to 100 pixels per inch. Make sure “Resample Image” is UNCHECKED. If either the Width or Height exceeds 40 inches (3000 px), you’re all good! If it’s between 20 inches (1520 px) and 40 inches (3000 px), our designers will be limited in their design options as they won’t be able to zoom in on details they like. But we should be OK. If it’s less than 20 inches (1520 px)... then no, the image is not good enough. Sorry.